I am grateful for the kind remarks provided by some awesome people! If you already have a Yelp account, you can quickly leave us a review here. If you already have a Facebook account, you can quickly leave us a review here. If you already have a Trip Advisor account, you can quickly leave us a review here. I'm glad you had an okay time, but I want to be exceptional! I'll get in touch with you soon to see how I can improve. Had an awesome time with my family. Nick was great and fun. Got enough salmon to fill an ice chest to bring home to Texas. 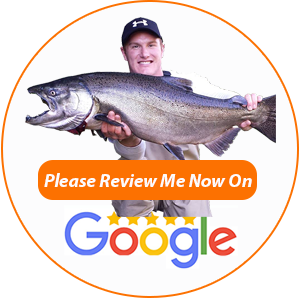 Wish I could attach my picture with my catch on this review it was awesome. Our family had the MOST amazing time with Olympic Peninsula Guide Service! My children said "this was the BEST DAY EVER"! They caught several fish but most importantly made memories to last a lifetime! Thank you Nick! Friendly service. I learned a lot and caught some big fish! If you are looking for a city getaway you found the place. Nick knows his way around the area like the back of his hand. He was the perfect guide for a fishing excursion and nature viewing. Had a blast on the river today with Nick. Just on a traveling job here in Forks for the month of December and would recommend anyone swing through Forks to give him a call if u are trying to kill time and like to catch fish! Thanks again Nick for the trip! Had a great time with Nick, knowedgeable, fun, put us on fish, one hell of a captain through technical water and list goes on. I won a trip for my husband and son that Nick donated for Orlando. He is a kid in our community fighting leukemia! They had a great time. Thanks Nick!